Using her clinical experience, psychiatrist Robin Berman shows parents how they can take charge while building a loving family with deep connections. How children learn love and respect at home becomes the template for how they show love and respect in life. It's a huge task, but Dr. Berman is your ally every step of the way. Every parent's struggles are reflected (many of them comically), but so are heartwarming triumphs. Parents, teachers and children themselves recount turning points at which they figured out what great parenting looked like and the magic it unlocked. This engaging book--a perfect mix of medical research and inspirational anecdotes--just might be the key to being the parent you want to be and the parent your children need. Parental anxiety is at an all-time high, and with parenting styles swinging from attachment parenting to that of "Tiger Moms," Robin Berman, MD, inspires mothers and fathers to find a graceful place in the middle. Children used to be seen and not heard, but now they are at the center of their parents' universe. Parents today seem skittish about asserting their authority. They indulge in their children's demands and tantrums, and enter into endless negotiations, all for fear of hurting their children's feelings. Sadly, this indulgence is creating a generation of psychologically fragile individuals, and it undermines the very self-esteem it seeks to build. In between these parenting extremes lies a better way to raise thriving, well-adjusted children. Parents need to know that it is not only OK but essential to be in charge. Children with too much power often become anxious, and not allowing children to work through negative emotions leads to a lack of resilience later in their lives. Permission to Parent teaches parents to be comfortable setting boundaries while maintaining a loving connection, fostering self-esteem, respect, and emotional maturity. Children need limits more than they need indulgences, time more than schedules, and love more than stuff. Robin Berman, MD, provides the tools for great parenting by drawing from her extensive clinical experience and wisdom collected from seasoned therapists, revered teachers, and role-model parents. 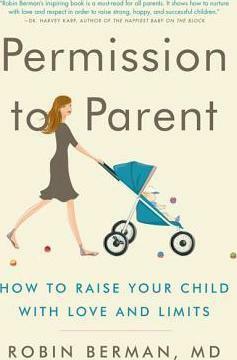 Permission to Parent strikes the perfect balance of advice, anecdote, and research to be an essential parenting guide.